Summary: Tuareg-led rebels in northern Mali have now completed their control of the region's major cities, after capturing the military headquarters in Gao as well as historic Timbuktu. Meanwhile, Mali has been suspended from regional organization ECOWAS in response to the recent coup d'etat in the capital, Bamako. Again immediately following our last update, northern Mali's National Movement for the Liberation of Azawad (MNLA), made up mostly of Saharan Tuareg people, has followed its victory in Kidal by capturing the region's other two major cities. 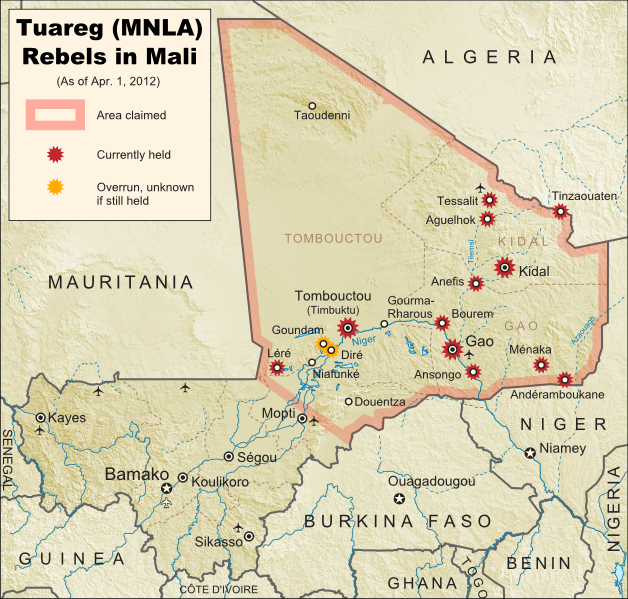 On March 31, the rebels took control of Gao, headquarters of the Malian military in the north, and the next day overran Timbuktu, a historic former trading post and modern tourism destination. The town of Aguelhok in the north is now also being reported as under Tuareg control, though it is unclear when it was recaptured (the rebels had previously taken and lost it again back in January). The military government of Mali, which took over in a recent coup d'etat, has now withdrawn its forces from most of northern region, known to the Tuareg rebels as Azawad. Neighboring countries have offered military assistance only if the country returns to democracy, and have suspended Mali's membership in the Economic Community of West African States (ECOWAS) while imposing tough sanctions. If help doesn't come soon, the MNLA could be in the position to declare independence in the north, making Azawad Africa's newest country. Follow events as they develop on Political Geography Now! To see only stories about this ongoing conflict, filter posts using the Mali label. Seen this map on Wikipedia?